For our top pick as the best sound machine, the Dreamegg Sound Machine has a very smooth flow will not startle you at all. It has a total of 6 relaxing sounds for you to choose from, including ocean and rain, and it is good for people who snore and baby nurseries. If you are suffering from tinnitus then this is a good unit. In fact, there is a memory feature even when you turn it off. Our step-up pick is the Marpac Dohm Classic and you can get different white noise in a custom way as it is not digital (it is mechanical). You also get two speeds due to its dual speed motor and it is ideal for most light sleepers as well, not just babies. It has a fully adjustable tone with a twist to adjust system and its acoustic housing makes it a mechanical white noise generator. The budget pick is the Big Red Rooster and this one also has 6 settings to choose from. It is portable so it can be used overseas or for travel purposes, so you can take it anywhere with your kids. It can produce various other sounds like thunder and rain. If you previously used fans as noise to fall asleep to, this kind of unit is a good choice. It can be set to 15, 30 or 60 minutes for its timer. A sound machine can give off soothing sounds. A sound machine is a kind of device that is capable of producing white noise that is soothing to babies and even for adults. This white noise generator can be found in most baby centers and shops as an additional appliance that is usually battery operated. However, some can be plugged into a wall outlet in order to power it up. The most probable use of a white noise machine or a white noise generator would be for putting babies to sleep. Babies can have difficulty in sleeping because they can get easily distracted and are more sensitive to sounds than adults and older children are. Therefore, it is necessary for parents to help mask away the outdoor noise by using a white noise generator that can also help calm down their baby or child. They can come in various forms, but most of them are either square or circular shaped with a speaker box to produce white noise. The designs of the white noise generator can be a factor in terms of the distribution of the white noise. For example, it might be able to distribute the white noise better if the speaker is on top or on the sides aside from just one side. This is important if your baby room is not very good in room acoustics. Some can come in digital form when producing white noise while others can come in the mechanical form in terms of producing white noise. Digital form types of white noise generator are more ideal for those who are in the budget because they can already produce a lot of white noise in one go, but are not very natural in terms of white noise quality. On the other hand, mechanical white noise generators are pricier but have a better quality in terms of white noise. Some of these units can help you sleep on a camping trip. They are mostly battery operated so that you can take them with you anywhere. This lets you take the white noise generator with you during a car trip when your baby can’t easily sleep. It is essential for when your child is distracted by outdoor noises and you just want them to sleep better. You can also use it in a camper, RV or hotel when you want your child to sleep comfortably wherever they go. Babies and children benefit the most from a white noise machine. Some of them even have lights that can help calm down your baby or child when he or she can’t fall asleep, as it can act as a night light of sorts. The lights may cycle depending on the brand that you have. Such lighted units can be a bit pricier but can be ideal for those who need night lights. Digital or mechanical: the white noise generator can either be mechanical or digital in terms of generating the white noise. The digital type of this unit can give you access to more than 3 types of white noise, which are all digitally recorded so that you can play them over and over again. They provide a less natural white noise but are cheaper. Portability: you have to consider a white noise machine that is easy to move anywhere. A portable one can be battery operated and charged on a power bank or some other source. This lets you travel with the white noise generator. It is good for when you want your baby to sleep soundly even in a hotel or another house or bedroom. White noise options: it should not only have a white noise option but a myriad of options as well. There can be different selections and settings, such as the noise of the rain, the ocean waves, a lullaby that is relaxing for your baby and many others. The selection should be easy to do and to switch between as well so that you will have less effort in handling your baby’s sleeping experience. Lights: some that have lights can be ideal for those who want a built-in nightlight as well. Most of the brands of white noise generators out there have 7 colors of lights that cycle throughout the operation. They cost more battery life but are great for nightlight purposes. Ease of adjustment: the white noise generator should be easy to adjust for its settings, whether it is for the lights or for the white noise. As we said above, an easy to adjust unit can be great so that your baby does not get startled by pressing the buttons and the like. Fading or ramping down: this makes the white noise generator more calming when it turns off. Imagine if the white noise suddenly stops when the battery runs out – this can startle your kids! For a true blue white noise generator to be calming to your child, it should have a fade down option when the battery is out. Good battery life: aside from a good battery life, the white noise generator should also have energy saving features in order to save up on battery consumption to avoid charging it often. For instance, it should have a feature that will lower the white noise gently when the battery is low. 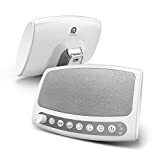 Durable housing: this is also important if you want to take the white noise machine or white noise generator with you to travels with your baby or little one. ABS plastic is often used for many white noise generators out there in terms of the housing material. If you do want the best sound machine, we suggest the Dreamegg Sound Machine. It has a total of 6 relaxing white noise that you can choose from so that it will suit your needs and you don’t have to listen to the same thing over and over again. It will help you to fall asleep quickly and will be helpful if you have kids as well, such as those who could have difficulty in sleeping at night. It can help them calm down due to the white noise that can mask away other background noises. In addition to that, the sound machine is quite portable so that you can take it with you wherever you go. You also have the various options for the white noise, such as ocean and rain, which can help you or your baby to soothe down. The unit can produce a soothing lullaby for babies as well, which can be helpful if they want something to help them fall asleep faster. It also provides a very smooth flow will not startle you, which is important if you are a light sleeper, or if your baby is one. The 60-minute auto-off timer can be set for 15 or 30 minutes as well so that you can customize the machine depending on how long you want to let it run for. For people who snore, the white noise generator can be a great masking choice for such annoying sounds. It can also be used for baby nurseries so that your child can fall asleep soundly and faster. It will also minimize the sounds of noisy neighbors such as pets and machinery if any, and there is also a memory feature even when you turn it off. Overall, if you are suffering from tinnitus, this unit can also be helpful as a great white noise generator that can be used in masking most ambient noises. It is backed by a 1-year warranty. The only con but not a deal breaker with the Dreamegg Sound Machine is that the other sounds may not sound as natural as other machines, but that is true with most in this price range. The Marpac Dohm Classic is our step-up pick, which has a more powerful design despite its price. There are a total of two speeds due to its dual speed motor so that you can select depending on your preferences to save up on electricity and consumption, and also not to break the motor too easily due to the adjustable speed. Working on 120v systems, the acoustic housing makes it a mechanical white noise generator, unlike the cheaper generators out there that use only digital white noise that does not seem realistic at all. You can still get different white noise with the Marpac Dohm Classic due to the fact that it has a fully adjustable tone with a twist to adjust system. This is highly important if you want a clear, concise and custom made white noise generated for you or your baby. It is also quite compact in terms of its housing, so you can take it anywhere with you. It does not sacrifice the solid durability as well, even while being portable. The Marpac Dohm Classic is a good choice to drown out noises from your neighborhood with its precise volume control. It is also a perfect gift for light sleepers. With this unit, you get a total of three color choices: white, black and tan, which can complement your bedroom setting as well. It is perfect for babies and children and is backed by a one-year limited factory warranty. The Big Red Rooster is our budget pick if you just want one that has 6 white noise in just one go. It has a seamless loop as well that feels natural, and it can produce sounds like the falling rain to help soothe your child or for someone who has ringing in their ears (tinnitus). It can also have other sounds such as a brook, which can help calm your senses. Because of its portable design, the Big Red Rooster can be used overseas so you can take it with you for traveling and the like. It can easily mask background noises due to the calm sounds of the ocean that are recorded in the unit. You can help your child get pleasant dreams with this unit with subtle sounds of rain and thunder as well. The portable design allows you to take it anywhere with your kids and the white noise really works well. There is also an option for a summer night ambient noise, which can also be soothing and relaxing overall. If you previously used fans as noise to fall asleep to, this can be a good choice for you. If you want to fall asleep easier then this is great for travel as a companion for sleeping. It can be timed at 15, 30 or 60 minutes if you wish. The Big Red Rooster is also convenient if you’re traveling due to the voltage conversion. It only requires 3 AA batteries or an AC adaptor to be powered up. 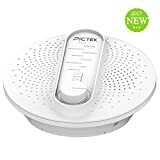 If you want a white noise generator that has many programs, the Pictek White Noise is a good choice. It has an auto-off timer from 30 to 60 minutes that can help you to set the appropriate time that you want to use it for. 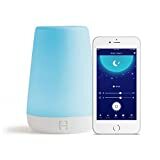 It even has 3 types of natural white noise with 24 sound options so that you can choose according to your needs and the favorites of your baby or child. 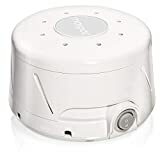 This white noise machine has an adjustable volume control so that it will not be too noisy for you when you try to sleep or if you are trying to get your baby to sleep properly. It will block out most neighbors and household noises with its white noise technology and is only powered by 4 AA batteries, which you can easily buy anywhere. It also keeps the memory of all settings so you don’t have to go an adjust it every single time you open the unit. 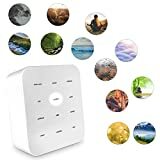 It is also a disturbance-free unit to keep you sleeping soundly if you are a light sleeper who may not be comfortable with too much quietness or too much noise. It is also a good sleep machine for babies aside from adults. With a 3.5mm earphone support, you can plug in your earphones and sleep properly as it stays on all night without any kind of disturbance or loss of noise at all. It is also deemed safe for babies due to the odor-free material that is made for the housing. It can also remember the volume settings by holding a button. This unit has a total of 8 working modes for you to choose from, based on what kind of ambient noise you want. It is also USB operated and only consumes 5V USB power, making it economical. If you want a unit that has a bass boost button, the iHome Zenergy Portable can be a good choice for you. As a white noise machine, it can produce fan noise that is very natural overall. It has a total of 12 relaxing sound modes that you can select based on your preferences as to which can be the best for you. Mimicking the sounds of nature, this unit is able to blend in with bedroom décor due to the good design outwards. It can also play thunderstorm and rain ambient music so that you can feel relaxed. It also has an option for a calming ocean breeze. For earphones or headphones, there is also an AUX-in jack for this option. There are also heartbeat sounds for your baby while the sound quality is good overall. There is also an included AC adapter (international use for 100 to 240v systems) and its included sleep timer gradually decreases sound so your baby will not be startled. It runs on 4 AA batteries as well. For those with sleeping problems, the Sharper Image Best can be a good choice. It has a total of 12 music options and it has a battery-powered option for traveling and the like while remaining in a soothing feeling. Furthermore, it can be used for both AC and DC for international travel use so you can take it with you anywhere. It even has an omnidirectional digital speaker that distributes the nature ambiance better than most brands. With a 30/60/90-minute timer option, this unit is great for general sleep therapy as you can have it on all night. It will not easily run out of battery and it has an assortment of options for the settings. You can use it at home for relaxation for your baby or for yourself, or you can use it for you to drown out the city noise at night. It also has an auto shut-off function that can help save up on electricity and battery life. It also provides good stress relief due to the variety of music that you can find there. It has a3.5mm headphone jack for headphone and earphone users as well and has a timer to make it more energy saving overall. If you have a baby and they need a night light and a white noise machine at the same time, the Hatch Baby Rest can be a good choice for you. It is a new product among the white noise generators out there that is easy to use and is a smartphone app integrated device. It has various ambient noise like a rain shower, which can help soothe and calm down your baby or your kid. One unique thing about this white noise machine is that it has a time-to-rise alarm for your kids to keep a good schedule for their bedtime. It can be programmed with your smartphone, which is very awesome and modern. The housing also looks stylish so it will blend in with existing décor in your kid’s bedroom. The color and brightness can also be changed and it can also be protected by the child lock feature to avoid your child playing with the settings. It can be easily adjusted remotely using your phone and it is indeed one smart device with two functions: noise and lights. It has a noise volume option and it can be set to turn on automatically as well on a given period. 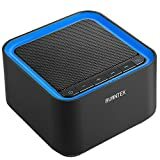 For those wanting to travel with a white noise machine, the AVANTEK White Noise may be a good choice for you. It has over 20 settings for you to choose from, including 6 white noise sounds. As a great feature, the sound will fade away gradually without disturbing you, so that you will not feel startled at all when the battery runs low. This is highly important if you are a light sleeper. With a total of 6 fan sounds, it has an LED indicator light that is not too bright so as not to disturb you. It has a total of 8 different ambient sounds as well, which can block out most ambient noise such as farm animal noise outside. In terms of the housing, the plastic is sturdy enough for most regular users. The unit will not distract you from your sleep due to the soothing sounds and the subtle light. It even has a memory function for a hassle-free operation. If you like water type sounds then this unit is good for you. It is quite convenient and lightweight and its timer can be set from 1 to 7 hours. 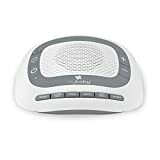 For those looking for a white noise generator that has lullabies, you may be in luck with the myBaby White Noise, which is also portable for travel due to the size. It has an auto-off timer for you to easily manage it when taking care of your baby. It has a heartbeat sound, which can be great for newborn babies and even younger kids. Bearing a low profile design, the unit has a total of 6 lullabies that can help your baby to stay asleep even on a trip, as a white noise machine for babies. It has good volume control, according to most reviewers, and it is a great companion to travel with the kids. You can set it to 15, 30, or 60 minutes depending on your needs. The unit can handle continuous play for overnight use, and it is also lightweight to carry around. The unit only uses 4 AA batteries or a wall adapter. If you want something that is for apartment use, the LectroFan High Fidelity is quite portable enough and is powered by AC or USB. It is fully electronic without noticing a loop so it is cheap but of quality sound, as compared to mechanical counterparts out there. It can give you rest and relaxation due to the various 10 fan sounds. For those who live in a place where neighbors have noisy pets, this can be a great choice for you. In terms of looks, it has a solid-state design so it is very sleek and conforming to your office or home. It can produce pure white noise that is pretty good, unlike the cheaper ones out there. This one can make non-repeating but continuous white noise, that you won’t be able to notice that there is a loop and that it is actually digital and not mechanical noise. Other sound machines or white noise generators did not make it to our list because they did not have a lot of options to choose from, were too bulky to carry around and were also not very durable and quality sounding. Some of them were also difficult to set up and didn’t have enough battery life. Q: What are the benefits of a sound machine? Babies can fall asleep faster with this device. It lulls them to sleep faster. There have been many studies that show how sound machines and their white noise can benefit babies and children to sleep more soundly faster and deeper. This means that a hyperactive child who may have trouble sleeping can feel a soothing sensation when they hear the white noise. This can help them to get a better night’s rest, which is needed for physical and mental growth and development. It may have nightlights to help them not get scared. Night lights are often found in some baby sound machines out there, and most of them can be configured to cycle through different colors as well. Many children are normally scared of the dark. With this problem, a good solution would be installing nightlights in the bedroom. But for a 3 in 1 solution, you can go for this kind of item if you find one that suits your budget. It blocks and neutralizes outside noises that might be distracting to them. Perhaps a good quality that you will find on a white noise machine is the ability to block out external noise. It is a two-way design that not only blocks out external noise but also soothes your baby or child into sleeping more soundly. Q: Can an app control this kind of white noise machine? Busy moms can now use app control for a white noise machine. A: Yes! Many white noise machines can be controlled using an app for your smartphone or tablet. This lets you monitor the noise levels, the lights (if any) and the program presets as well as the timer option. Having a controlled white noise machine from an app lets you feel at ease even if you are far away from your baby. Q: What are the benefits of sleeping early? Children are often reminded to sleep early for school. Stress reduction Those who feel stressed often are usually the ones who have lack of sleep. Therefore, by maintaining a good sleeping schedule, they can lessen their worries and recharge better for the next day. Better creativity Sleeping also helps you to process our memories and create new things for the next day ahead because your brain sorts out information better when you sleep. Improved mood A good sleep also keeps you recharged for your next work or activity so that you don’t feel down in the dumps or irritated. Less tired feeling You will less likely have that tired feeling when you get up or during the afternoon when the hours seem so slow in class or at work. Work productivity If you sleep early or on a regular schedule, there will be great work productivity by next day on a regular basis. This is because you will most often feel energized. Weight loss Did you know that sleeping early can also contribute to better weight loss? This is because you can also potentially burn calories in your sleep. Driving safely If you have properly slept the night before, you can definitely be more alert when you drive a car, motor or any other vehicle. Immune system boost Sleeping early also helps you to stay healthy, boosting your immune system, meaning that you will less likely have colds, cough, flu or allergies. Live Longer Overall, if you maintain your health by sleeping early or on a regular schedule, you will less likely have health problems and you may live longer than expected. Q: Can a white noise machine be used in an office setting? 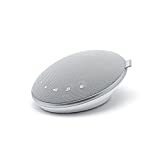 Some office settings can make use of this white noise machine. A: Yes! Most white noise machines can be used for home and office settings. This can help people be relieved of stress and tension or have them feel less anxious due to a super quiet environment full of busy people on their computers. Q: What are some helpful ways to treat insomnia? Insomnia can be hard to manage. Wake up early Waking up early may sound like a big chore for you, because you will feel very tired in the afternoon, but if you can control it by engaging in a physical activity throughout the day, you will most likely get knocked out by nighttime, which can help kick-start your new sleeping schedule. Work elsewhere other than your bedroom The temptation of sitting on your bed is a major cause of sleeping problems. You should control and condition your mind that you need to stay awake for work and stay out of your bed if you are working at home (e.g. as a freelancer on a laptop) and then only go to your bedroom when it is time for bed. Sleep Masks Try sleep masks if you are easily distracted by lights. This works for people who are light sleepers and can be easily awakened by even a nightlight. Try soothing music You can play a good Spotify playlist to lull you to sleep if you can’t afford a white noise machine. Don’t look at the clock Looking at the clock will only make you feel anxious with thoughts like “oh crap, it’s way past 12 AM, I failed my sleeping schedule again”, which will give you anxious thoughts altogether, causing insomnia. Clocks can give people a great amount of anxiety, even when awake, so you should just forget about time for a while and focus on sleeping instead. A: Tinnitus is also known as ringing in the ear, and is a condition that can be quite annoying for some people, thus making their sleep schedules imbalanced. Tinnitus is best dealt with when you use white noise or pink noise so that you can condition your brain and ears to have a better listening frequency. Q: What is the difference between white noise and pink noise? White noise Has a consistent noise and pattern that is ideal for light sleepers and for blocking out noise outside. Pink noise This is a special noise that has a lower volume and pitch and is ideal for people with tinnitus or ringing in the ear symptoms. Q: What is the ideal range of volume for a white noise machine? A: Your white noise machine should have somewhere between 50 dB and 75 dB in order to be safe for your ears. Anything that can be above that will be quite dangerous to your ears, akin to the sound of a very loud drill or power tool. This is why you need to consider a safe level of volume, especially if you want to use it for your child or baby, as they are more sensitive to sounds than we are. Q: Can you achieve white noise with an electric fan? Electric fans can also produce white noise. A: Yes! An electric fan is the most common way to get white noise, especially for regions in the world where A/Cs are expensive. The usual noise level of an electric fan is around 65 dB or less, for it to be quiet and soothing. Many people who have trouble sleeping in a super quiet environment without any noise at all can have the cooling effect and the soothing noise of an electric fan. Q: Is it okay to use an aromatherapy diffuser with a white noise machine? A: Yes! Both of these two kinds of units are capable of helping you to sleep better, so you can use them both. They can be used for babies who can’t fall asleep easily, or for insomniac people who may have trouble sleeping as well. Aromatherapy scents like lavender can help you fall asleep easily and the white noise machine can mask away outdoor ambient noises as well. Q: What are the best uses of noise masking? Nurseries and at home For your baby to not get distracted by outdoor noise. Hospitals To help doctors and patients to feel privacy and comfort at hand. Offices Offices need to be private in terms of executive conversations. Call centers Same reason with offices, but mostly to help them focus on the job. Lobbies A lobby can help keep a conversation clear even when there are workstations nearby. Schools If your school has this program, they can help teachers and students understand lessons better. Q: How does white noise help a baby fall asleep? A: Originally, before a baby is born, the womb can produce about 80 to 90 dB of white noise, which you can mimic by using a white noise machine or just giving a nice “shh” to your baby to help lull them to sleep. The natural womb white noise is due to the maternal blood flow, so it is definitely okay for your baby to hear white noise in order to sleep properly. Q: How are binaural beats different from white noise? A: White noise is just one frequency, but binaural beats can vary in speed, frequency and the like. However, like white noise, binaural beats can also have an effect on your brain, which can help alleviate sleep disorders and restlessness. White noise, however, is more recommended for babies, while binaural beats are more ideal for adults. Q: Is it possible to just download white noise from the internet? A: Yes! Many white noise machine manufacturers can offer free files from the internet for you to download so that you can place them in your mp3 player or your phone for future reference. You can also search many white noise background videos on YouTube and the like. Q: How can a white noise machine be ideal for travel purposes? Q: What are some important things to consider when keeping your baby sleeping better without distraction? Helping your baby sleep properly is an important aspect of parenting. Newborns may need up to 16 hours of sleep a day – that’s almost like how much a cat sleeps. Make sure you divide the night work between you and your husband. A little white noise wouldn’t hurt, such as the TV and other subtle noises. If you can, try sleeping when your baby sleeps as well. Toys that can be a risk for suffocation should be kept away from the crib. Q: If I’m going to lull my baby to sleep while on travel, does the travel crib matter? Q: Are there any drawbacks to a white noise machine? Not all children may react the same to a white noise machine. There are some kids that like peace and quiet without a single sound, and that makes a white noise machine ineffective for them. Do you ever wonder how some people can sleep with an electric fan but some need a super quiet air conditioner? Some people sleep lightly and some sleep deeply – it depends on your preferences, and in this case, your child’s. If the white noise generator is too loud then it might damage your child’s hearing. Something that is too loud can potentially make your child’s hearing, not too good. Some of them can be expensive. They can be costly as compared to just using YouTube or an mp3 player to play continuous white noise or the natural sounds of rain outside. Q: What are the two types of white noise machines? Mechanical Mechanical ones use a motor inside in order to generate white noise. They are more expensive but are more natural sounding. Digital Digital ones can offer a plethora of noise and ambient backgrounds. They can be cheaper but less natural sounding. Q: Aside from a white noise machine, what else can I use to help my baby fall asleep better? Room shades – this can help you darken the room to help your baby sleep better. Sleep sack or swaddle – this can help keep them more comfortable on cold nights. Pacifiers – this can also help them with their sucking reflexes. Rocking motion – you can do this manually with your arms, with a stroller or with a rocker crib. Overall, the Dreamegg Sound Machine is our pick for the best sound machine because the very smooth flow will not startle you. Its 6 relaxing sounds that include ocean and rain can help not just babies but also adults who suffer from sleeping problems. The memory feature is helpful for going back to your settings or favorites.